There’s more to the popular instant ramen noodle packages you see on supermarket shelves with artificial ingredients and pre-packaged hot sauce components than you might initially suspect. In fact, a true bowl of ramen is not anything but an instant process. Ramen noodle soup’s origin story stretches back hundreds of years, traveling through trial and error runs across Asia to make it the renowned Japanese dish it is today. Through a series of candid snapshots, watch as our very own Chef Wing makes scratch-made noodles with our brand new machine. 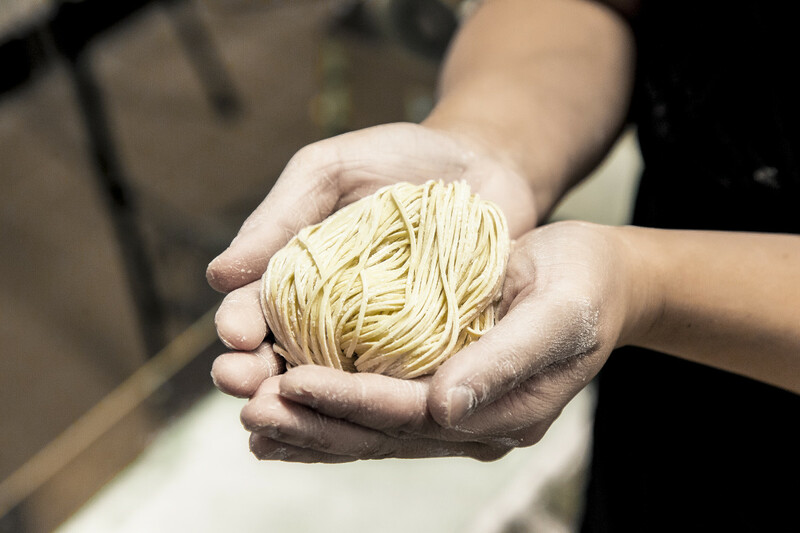 Let’s start by unrolling the long and skinny history of handmade ramen noodles that has made its way to our Nomiya kitchen today. Ramen was one of the first industrialized foods in Japan. Legend has it that ramen was introduced to Japan from China around the 17th Century. “Shina soba” comes from the phonetic rendering of the word “China,” while and “soba” is derived from wheat-based Chinese noodles. It wasn’t until 1910 that Japan’s first ramen shop “Rairaiken” opened in Tokyo and served simple Chinese noodle soup with traditional Japanese ingredients such as dried fish, seaweed, soy sauce, and any other number of the creative add-ons that we see in ramen noodle bowls today. The desire to improve the taste of ramen became the next evolutionary step in bringing ramen to the forefront of Japanese cuisine. By the late 1910s, a mechanical noodle-making machine revolutionized ramen noodle making. Ramen is traditionally hand pulled, which means that its dough has a higher water content than noodles that are normally rolled and cut. The crumbly dough is kneaded on a work surface and rolled in portions through the noodle machine. The ramen frenzy in the ‘80s and ‘90s gave birth to ramen celebrity chefs, museums, video games, and finally led to North America’s complete embracement of ramen and Japanese culture. Now, there are over 30 ramen varieties available across the globe. The norm of ramen dining in Japan calls for you to slurp your bowl quickly so another customer can enjoy their bowl of ramen once you’re finished. The word “ramen” is based off the Chinese words that mean, to “pull” and “noodle.” After the noodles have gone through this process, the noodles are dusted with wheat flour and elegantly twirled into serving-sized portions. Keeping the noodles well-floured prevents them from sticking together, and retains its unique flavor. Ramen noodles get soggy quickly and should be eaten immediately once they are served. Nomiya’s ramen process utilizes all of the techniques and components of traditional ramen. Our homemade broth is a special recipe that comes from a labour of love 45 years in the making and takes 8 hours to simmer. We are proud to announce our newest addition to serving Edmontonians an authentic Japanese dining experience with Japan’s favourite comfort food. If you’re interested in getting an exclusive first tasting of our new handmade noodles, join us for the Handmade Ramen Teishoku Tasting on March 14th at the link below!